Bill McAnally Racing driver Derek Kraus won the K&N Pro Series West 2017 Rookie of the Year. 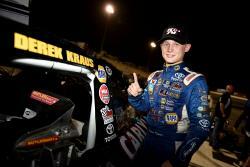 NASCAR K&N Pro Series West rookie driver Derek Kraus saved his best race for last. He won the K&N Pro Series West season finale at Kern County Raceway Park in California. It was the first win of his K&N Pro Series West career and it helped him lock up the Sunoco Rookie of the Year award. Kraus took the lead from Dillon Bassett on lap 106 of the West Coast Hall of Fame Championship 150 presented by NAPA Auto Parts and led to the checkered flag. With Eric Holmes, a former NASCAR K&N Pro Series West champion, as his spotter, Kraus was able to maneuver his way to the front of the field. Holmes told Kraus repeatedly to save his tires throughout the race. I paid off during the last 50 laps of the race. “I think my car had better long-run speed and that’s what really helped us to win the race at the end of the night,” Kraus said. Kraus posted three runner-up finishes in his rookie season before breaking through in the season finale. The car in the Kern County race was the one his team used in the first four races of the season. It posted some good finishes but didn’t notch its first win until the final race. Kraus had nine top-five finishes in his rookie campaign, a number matched by fellow K&N Pro Series West rookie Will Rodgers. Kraus won the rookie of the year award by seven points over Rodgers. Kraus said he gained a ton of experience in his rookie season in the K&N Pro Series West. One of the biggest benefits was traveling to different race tracks, especially Sonoma Raceway in California, the only road course on the schedule. “The hardest was getting adjusted to the new tracks,” Kraus said. “Every track we went to was brand new for me. That’s what I like about it too. The hardest part was getting adjusted to every new track that we went to. It was really fun learning all these different tracks, Kern County, they got a really nice place out there in Bakersfield. Tucson, Arizona, I really liked their track how you can spread out a bunch. Iowa I really enjoyed and Sonoma as well. Kraus finished second at Sonoma, behind NASCAR Monster Cup Energy Series driver and champion Kevin Harvick. Kraus said when he tested with Bill McAnally Racing before the season started, he knew he would have good cars. The testing gave Kraus a ton of confidence heading into his rookie season. In addition to having solid cars, his teammates, Todd Gilliland and Chris Eggleston, at Bill McAnally Racing proved to be valuable assets. 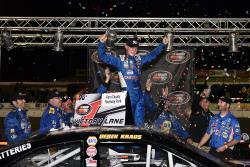 Gilliland won his second K&N Pro Series West championship in a row. Eggleston won the K&N Pro Series West championship in 2015. Having K&N as a sponsor and supporter of the series gave Kraus opportunities he wouldn’t have otherwise.